Day of rest. Went to church. Happy Father's Day! 12 total. Benjamin did 6, Jenny 4, Julia 3, Joseph and Jacob 3, William 1, Stephen 0.5. 6 47:24.20. 7:54.03 With Benjamin. 3 25:31.30. 8:30.43 With Julia, Joseph, and Jacob. 0.5 4:54.50. 9:49.00 With Stephen. Total of 12.5. Benjamin did 7, Jenny 4, Julia, Joseph, and Jacob 3, William 1, Stephen 0.5. Sarah and the kids had an adventure today on their way back from the eye doctor appointment. Somebody robbed a bank nearby and fled in a van resembling ours. The bank manager pointed at our van, so the SWAT team went after it. All of a sudden they were surrounded by a multitude of police cars that came out of nowhere, and Sarah heard "you are considered a dangerous person" over the loud speaker. She came out with her hands up in the air and had machine guns pointed at her. Then they had the kids come out of the van. Finally they realized they had the wrong van, but by then the real robbers had gotten away. I have been checking the news to see if they have been caught - no result so far. This reminds me of an episode in "Singles Ward" - "Put down the casserole and step away from the minivan!" 7 55:12.10. 7:53.16 With Benjamin. 1 8:15.50. 8:15.50 With William, Joseph, and Jacob. We sped up in the last quarter. William did 1:52 - I stayed with him. Joseph and Jacob ran it in around 1:34. 0.5 5:06.70. 10:13.40 With Stephen. Total of 12.6. Benjamin did 9.1, Jenny 4, Julia, Joseph, and Jacob 3, William 1, Stephen 0.5. 9.1 1:10:10.20. 7:42.66 With Benjamin. 0.5 5:29.20. 10:58.40 With Stephen. Total of 12. Benjamin did 9, Jenny 4, Julia, Joseph, and Jacob 3, William 1, Stephen 0.5. 3 23:55.50. 7:58.50 With Benjamin, Joseph, and Jacob. David joined us after about 0.4. 6 46:04.00. 7:40.67 With Benjamin. We did a pickup up the canyon for a mile in the middle. I felt better than I expected. 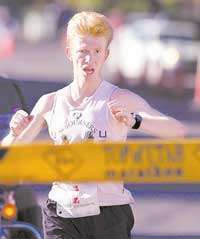 Hopefully I am recovering from whatever it was that left me flat in the Utah Valley Half (lack of sleep, most likely). 1.5 13:07.00. 8:44.67 With Julia. 0.5 5:12.80. 10:25.60 With Stephen and Julia. Somehow I managed to talk Stephen into running the last quarter without holding the hand. He did it in 2:39. For those who are wondering - I botched an upgrade on the Fast Running Blog server, and all the devils broke loose. I ended up having to do quite a few boots from the recovery USB drive, and I got really good at typing init=/sbin/init --verbose before I figured out why it was not booting, or rather before I figured out the workaround that would make it boot. We are still not quite out of the woods yet, but at least we are functional enough for me to post this. It may take a couple of days before we are fully operational - given the fact that I need some sleep, and have other responsibilities. In the meantime, report the errors when you run into them. Total of 12. Benjamin did 9, Joseph and Jacob 2, Julia 3, Jenny 4, William 1, Stephen 0.75. Today was the day of records. I took the little boys to the BYU track. William ran 400 in 1:44.1, Jacob did 800 in 3:00.5, Joseph did it in 2:53.0. Details to follow. 0.37 4:12.90. 11:23.51 Warm-up with Benjamin, Jacob, Joseph, William, and Stephen. 0.248 1:44.10. 6:59.76 With Benjamin and William. William opened the first 100 in 25, then did 26, 26, and 27. I was happy with the result. His previous quarter PR was 1:51, but that was at the end of a mile. 0.496 3:00.50. 6:03.91 Benjamin and I paced Jacob. He opened in 42, then became very doubtful and slowed down to 48, but then realizing he would miss his record if he did not get his act together he sped up to 45 and 45 in the kick improving his record by almost 2 seconds. I was very pleased with this recovery. 0.25 1:48.80. 7:15.20 Jog with Benjamin. 0.496 2:53.00. 5:48.79 Benjamin helped me pace Joseph. He opened with 42, then became a little doubtful and slowed down to 44, but then he sped up to 43, and though he struggled in the kick (44), he pulled off a PR by one second. 0.5 3:45.10. 7:30.20 Jog with Benjamin. 0.75 6:31.20. 8:41.60 Jog with Benjamin, Joseph, and Jacob. 0.38 4:10.20. 10:58.42 Back to the car with everybody. 5.5 44:33.50. 8:06.09 With Benjamin. Only 12.5 today, all with Benjamin, due to only 2 hours of sleep last night recovering the Fast Running Blog server from a botched upgrade. It did upgrade, and I learned a lot on the positive side, and I also thought of some cool job interview challenges resulting from that experience. On the negative side I had to cut down my long run as a precaution although I did feel quite good for this kind of sleep. Benjamin and I did a 2 mile tempo in the middle down the canyon. I told him to take the lead and run 6:00 pace. He ran 5:37/5:21 instead, but I was able to keep up and felt quite decent. Stephen ran 0.5 without holding the hand, Joseph and Jacob did 3, Julia 3, Jenny 4, William 1. 3 25:19.60. 8:26.53 With Benjamin, Joseph, and Jacob. 0.5 5:41.40. 11:22.80 With Stephen and Benjamin. 9 1:05:55.10. 7:19.46 With Benjamin. 2 2.000 10:58.50 5:29.25 Tempo run down the canyon - splits of 5:37/5:21. Benjamin set the pace with the idea of running 6:00, but 6:00 was too slow for him. 3 2.300 17:18.80 7:31.65 Back to the house.